To start, I should note, I’ve never been really into short stories, and what few I’ve enjoyed have generally been of some genre. My first encounter with short stories was Stephen King’s Night Shift, and “Strawberry Spring” remains my favorite example of the form. Over the years, I’ve read more, but I’ve never really loved the form like I’ve loved novels. They often seem too brief to sustain much in the way of an emotional attachment, and I like to see characters learn, grow, surprise themselves. That’s what makes stories so exciting to me, and is conversely what keeps short ones from fully engaging me. On the other hand, short stories provide a great opportunity for experimentation novels can’t. Sitting down to write a novel is commitment enough I generally feel I better be damned sure it’s going to work before I waste any time on it. A short story, though? Five thousand words? That should take, like, a week, tops. And it’s short enough experiments are more likely to be successful, because what generally shows the flaws in an experiment is going on long enough they become glaringly obvious. Now, I’ve written short stories. Anyone who’s read Entrekin knows that, of course. I continue to stand behind them. I think they’re good. I have never, ever thought I nailed a short story the way I nailed “Struck by the Light of the Son,” though. I’m seriously, seriously proud of it. It starts with songs. I often hear songs that pull me in certain ways. Often, those ways are very specific but also indistinct. I have a huge collection of music, and indeed, I sometimes think I would have been more involved with music if I’d learned to play an instrument cooler than a clarinet. Not that there’s anything wrong with a clarinet–Benny Goodman was the man–but let’s be honest and acknowledge Benny Goodman was no Keith Richards. So I had this feeling I knew I wanted to capture but wasn’t sure how, and then, in a workshop with Janet Fitch, we did an exercise in which we wrote two-page “stories” based on a single-word prompt. I put “stories” in quotes there because I failed at the exercise every time; that’s flash-flash fiction, and I can’t tell you a story in three paragraphs. I can’t emotionally connect to three paragraphs. But the word for that week was “fret,” and I suddenly realized my story was about a guitar lesson, and I saw the father in my story. I saw his blue shirt. I saw a cigarette, too (and later realized that was just my imagination). I dashed off a story about a guitar lesson, I think. I don’t remember it. I don’t think it was very good. I’m never very good in two pages. Give twenty, and I can be good (give me two hundred and I can be great). Two? And then I put it aside. 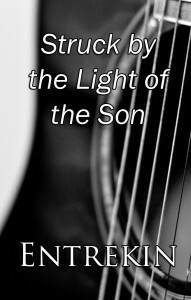 I wrote another story, and I finished The Prodigal Hour, and I finished Meets Girl, and then later, I sat down with a playlist of covers of the song in my head, and I wrote “Struck by the Light of the Son.” It was originally a couple hundred words longer–some Biblical stuff was cut immediately. It wasn’t needed for the story, just for the writing of it. I think what made it work was getting into Bon’s head. Watching a marriage start to implode through the eyes of a young boy who didn’t know what a word like “implode” meant, and for whom “marriage” meant only mom and dad. And look! Here’s the story itself! On Kindle. Which means you can read it on your phone, or your iPad, or your PC or Mac . . . So exciting how that works. I’ll be making “Blues’n How to Play’em” available in the next week or two, and then some more exciting stuff. How Much Is That Writing on a Kindle? I love your short stories, Will, and Struck by the Light of the Son certainly deserves the admiration Richler goes on to speak of.